Canvas was first introduced by Apple in 2004 for use in Mac OS X and Safari. Now it has been adopted by every major browser. Current versions of Mozilla Firefox, Chrome, Opera, Safari, and IE 9 and 10 all support the <canvas> element. The following code adds a <canvas> element. 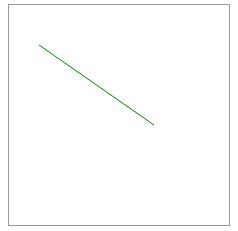 The following example shows how to draw a line on the canvas. The code draws a straight line from coordinate (30, 40) to (145, 120), with the upper left corner of the canvas acting as coordinate (0, 0). It should be noted that <canvas> elements do not maintain any DOM. As a result if you want to alter anything on the canvas, you will probably have to redraw the whole thing. The modified canvas is shown in the following figure. 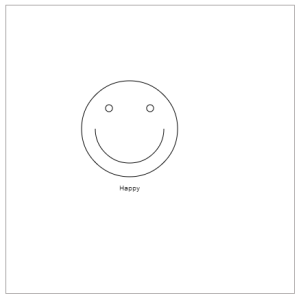 Before moving on to animations, you need to understand the basic shapes that can be drawn on canvas. We will need these basic shapes every time we want to create something. Let’s start with the following operations related to rectangles. As you can see, the fillRect() method creates a rectangle and fills it with the color specified by the context.fillStyle property. 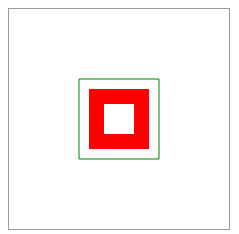 clearRect() clears a rectangular portion from the canvas, and strokeRect() draws a rectangular outline whose color is determined by the context.strokeStyle property. Lines can be drawn using the lineTo() function. The method takes two parameters which represent the coordinates of the end point. To draw a line you need to first call moveTo(), which represents the starting point of line. The first example in this article draws a line in this fashion. 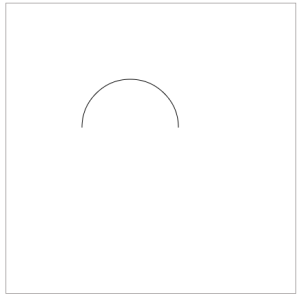 An arc is drawn using the arc() function, shown below. The first two parameters represent the center’s coordinate. startAngle represents the starting angle for the arc. To create a circle, set this to zero. The endAngle determines the angle at which the arc ends. 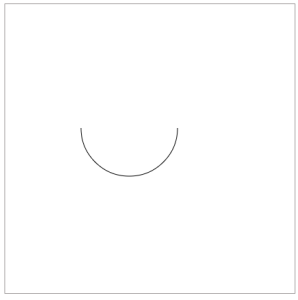 While drawing a circle you will set this to 360 degrees. For a semi circle it should be 180 degrees. Note that the angles should be specified in radians. Therefore, you should use the Math.PI constant to convert from degrees. Finally, the direction parameter denotes, whether the arc should be drawn clockwise or counterclockwise. However, if you want to change the direction to clockwise then you need to call arc() with the last argument set to false. This results in the following output. Usually a path consists of several shapes. Each path is internally represented by a list of sub paths like rectangles, lines, or arcs. Paths can be drawn using the following functions. Every path maintains a list of sub paths. When beginPath() is called this list is reset and we can start drawing different shapes for the path. The following example shows the path functions in action. The resulting canvas is shown below. Drawing an image on canvas is pretty easy. You can create an Image object and draw it on the canvas as shown below. For a complete tutorial about drawing basic shapes you can refer to the Mozilla Developer Network documentation. This example will create an application containing a bouncing ball. You need to catch the ball with a paddle when it reaches the bottom of the screen. We will use the setTimeout() function to create the animation. We already know that whatever you draw on canvas persists until you clear it. So, to make an object move on canvas you need to call a function periodically that clears the canvas and updates the position of the object. In our case, a custom draw() function will be called every ten milliseconds. It will clear the entire canvas and update x and y coordinates of the ball. This gives the illusion that the ball is moving continuously. Sorry, browser does not support canvas. You can try out the game via the online demo. Note that several optimizations and improvements can be done on this game. First we begin by defining two objects, ball and bar. The bar can reflect the ball when it reaches the bottom of the screen. The variables dx and dy determine how fast the ball moves along the x-axis and y-axis, respectively. dxBar represents how fast the bar moves along the x-axis. The init() function is called when the body is loaded. Next, we register an event listener which listens for keydown events. If the user presses the left arrow we shift the x value of the bar by dxBar pixels left. If the user presses the right arrow we shift the bar to the right. Then we initialize the canvas and get a 2D context which initializes the ctx variable. After that, we register the draw() function with setTimeout() so that it will be called every ten milliseconds. Every time draw() is executed, we clear the canvas and draw the updated ball and bar. Inside the function we check whether the ball collides with the bar. If so, the ball bounces back. If the ball gets off screen, the canvas is cleared and the animation stops, ending the game. If you’re interested in improving the game, check out the guide to optimizing canvases. You could also use requestAnimationFrame() to perform animation. It instructs the browser to schedule a repaint of the window so that the next animation frame can be rendered. Unfortunately, it’s an experimental technology and its specification has not stabilized yet. You should also learn about various transformations that can be done on the canvas and check out a few animations in MDN.